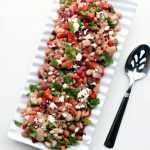 15 Bean Salad –a variety of dried beans are cooked in your electric pressure cooker or slow cooker and then stirred together with a red wine vinaigrette dressing, red bell pepper, feta cheese and cilantro. This salad serves a crowd and is perfect for a potluck or picnic. Big thanks to Hurst’s Beans for sponsoring this post. I usually make soup out of Hurst’s 15 Bean Soup mix but it’s getting hotter here and soup season is drawing to a close. Last week it actually got up to 82 degrees or something crazy like that. It reminded me of summer. 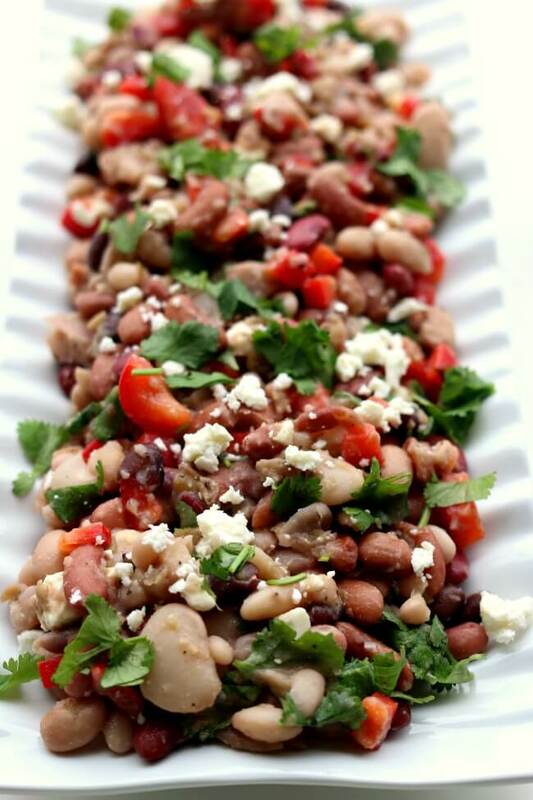 This 15 Bean Salad also reminds me of summer. It’s totally something that I’d bring to a potluck picnic at the park or an outdoor barbecue. You can cook the dried beans in your slow cooker, Instant Pot or even on your stove. Then you just stir in an easy-to-make homemade salad dressing, some feta cheese, diced red bell pepper and some chopped cilantro. It’s simple to put together, tastes great and serves a crowd. 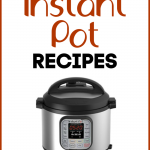 I love using Hurst’s products in the Instant Pot and the crockpot. There are so many options to choose from. 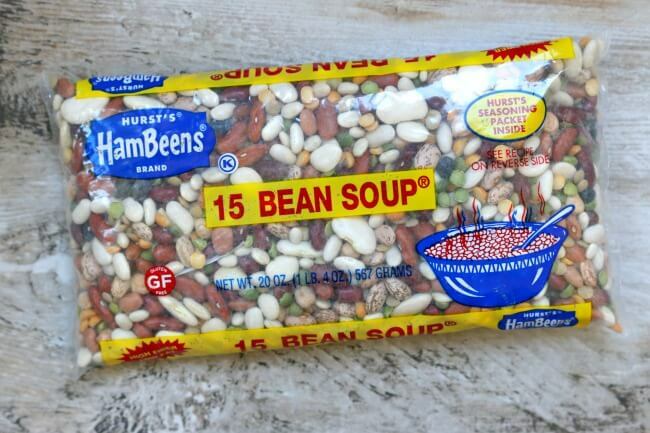 My personal favorites are the 15 bean soup mix and the bacon and beans soup mix. 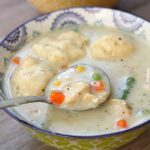 The flavorings are spot on and they require very few ingredients. Look in the dried beans aisle at your grocery store to find them. 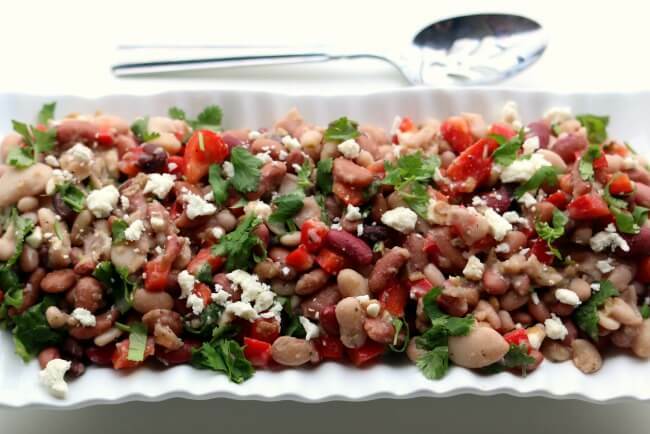 A variety of dried beans are cooked in your electric pressure cooker or slow cooker and then stirred together with a red wine vinaigrette dressing, red bell pepper, feta cheese and cilantro. This salad serves a crowd and is perfect for a potluck or picnic. Soak the beans: Dump the beans into a large bowl. Fill the bowl with water to cover the beans by at least a couple inches. Add in 1 Tbsp salt. Let the beans soak overnight for about 8-12 hours. Rinse and cook: Pour the beans into a colander and rinse the beans thoroughly with cold water. 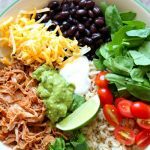 Add the beans to a slow cooker or an Instant Pot. Add in 6 cups of water and the seasoning packet that came with the beans. Slow cook the beans for about 8 hours on low, or until beans are soft. Or pressure cook the beans by hitting the manual/pressure cook button on your Instant Pot and setting the timer for 15 minutes (high pressure). Make sure the valve is on sealing. Once the time is up release the pressure by moving valve to venting. Make the dressing: Rinse the beans once again in the colander with cold water. Prepare the dressing by mixing together vinegar, olive oil, garlic, sugar and lime juice. 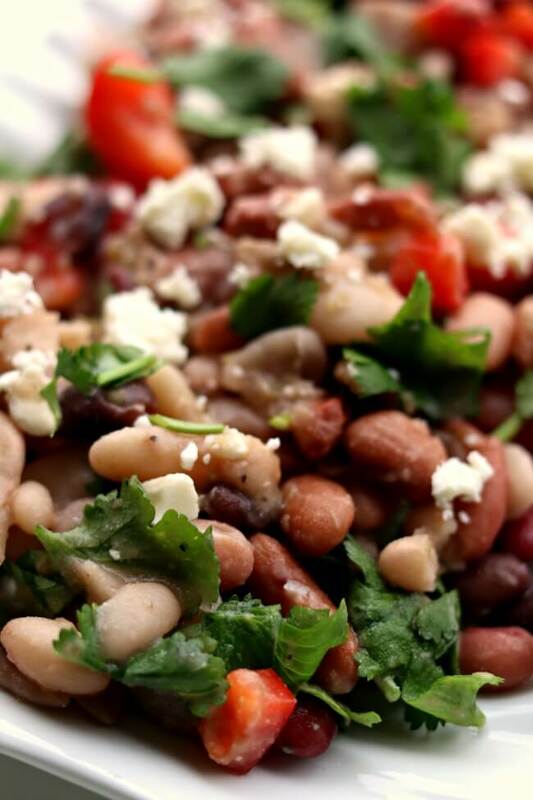 Prepare the salad: Toss the drained beans, dressing, red pepper, cilantro and feta into a large serving bowl. Salt and pepper to taste. (I added in quite a bit of kosher salt). Refrigerate the salad until the beans are cool and serve. Store leftovers in an airtight container for up to a week in the fridge. 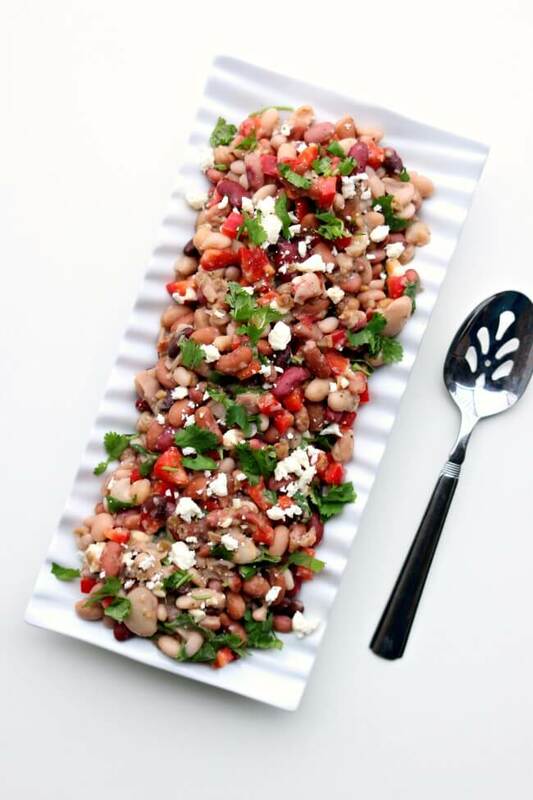 Like this recipe for 15 Bean Salad? Get all my new recipes delivered to your email inbox by signing up below. Why do we soak the beans in this recipe? I never soak beans before cooking in my iPot? I like the texture better not to mention the digestive issues that it helps out with! To halve the recipe, do you use 1/2 bag of beans and only 3 cups water? yes, that’s what I would do. Tasty but some of the beans were very mushy. Wouldn’t take it to share but will eat for lunch at home. 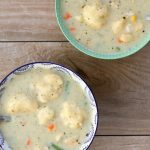 The only issue with this recipe is that the many different beans require different cook times which makes for a mushy display. 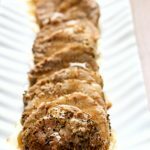 The recipe is quite delicious and perfect for the Summer. Thanks! What is in the seasoning packet? Just wondering what I could sub for it if I don’t have that brand of beans? Oh sure. 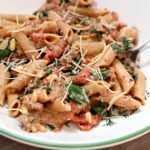 You can leave it out and use goat cheese or cubes of cheddar or whatever you like! I want to take this to a staff lunch, but out boss doesn’t like cilantro. What other green would you recommend? Spinach, basil? Spinach or basil would work very well. Yum I love both!